Whoa! Black background is black. As you can see, I finally had to switch my white background out for a black one. (Or else none of you could see this product.) The black creates a bold and graphic look, which I like, but I also feel like it makes the food look dark and gloomy. I think I'll stick with the white background and use the black when I have to. This post is a little bit different than my typical reviews. Normally I find items I have never had before, taste them, and review their packaging. Well, I think most of you know what this is, it's just a bottle of cow's milk. I have been drinking cow's milk since I was a toddler, so this is nothing new, but it is a bit different than what I'm used to. I usually buy the big, generic, plastic jug of milk from the grocery store, but what we have here is a beautiful glass bottle filled with organic milk from grass fed cows. 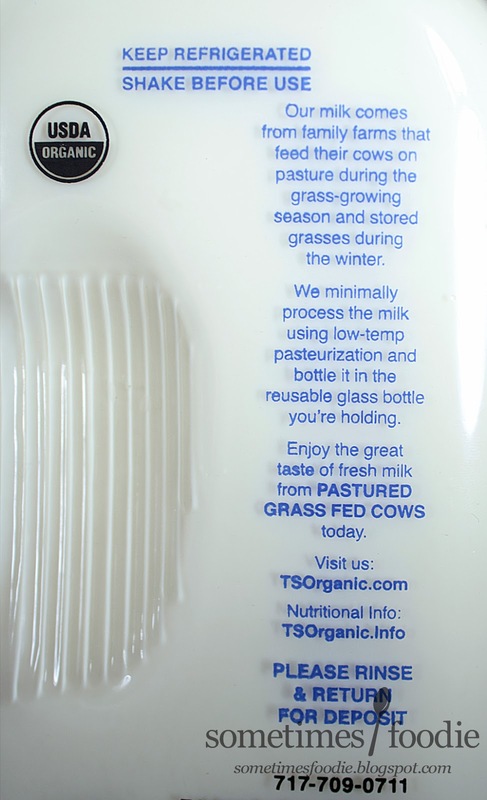 The milk I traditionally buy at the grocery store doesn't boast that it's organic or grassfed, and I very much doubt it is, so I was wondering if this would really taste any different. Time for a milk-based experiment. 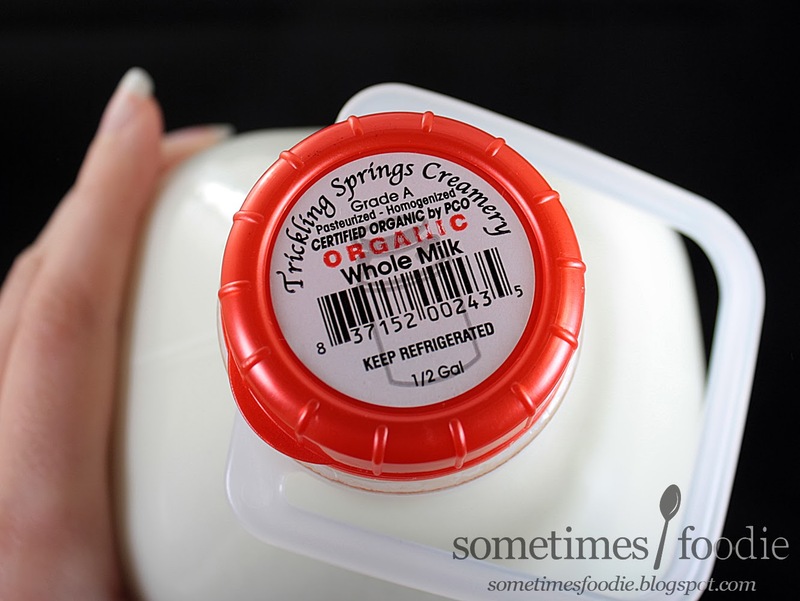 Does organic milk taste any different from grocery store brand milk? Trickling Springs is located in Pennsylvania, which is really close to New Jersey, so not only is this organic and grass-fed, but it's local. I'm really looking forward to trying this milk. Lately I feel like a lot of the basic staple groceries (cheese, milk, orange juice, bread...etc) have become so processed that they taste nothing like they are supposed to. After working at Panera, and making my own bread at home, I have started hating the over produced square bread loaves stacked up on grocery shelves. (Am I becoming a food snob?) I wonder if I even know what real milk tastes like. My sister works at barns and has been to dairy farms, and she says that milk straight from the cow is entirely different than the watery stuff we've buying the the grocery stores. I'm a city girl, so I'm not about to drive out to the farm and find out (yet), so this little experiment will hopefully satisfy my curiosity for now. Briefly, I wanted to talk about this packaging and the pros and cons when compared to the plastic milk jug I have been buying all these years. Okay, now to compare and contrast! So I poured myself a glass of the organic, grass-fed, local milk and one from my generic plastic jug. When they were being poured I noticed that the consistency was about the same, but the organic version coated the glass with a slightly thicker film than the grocery version. 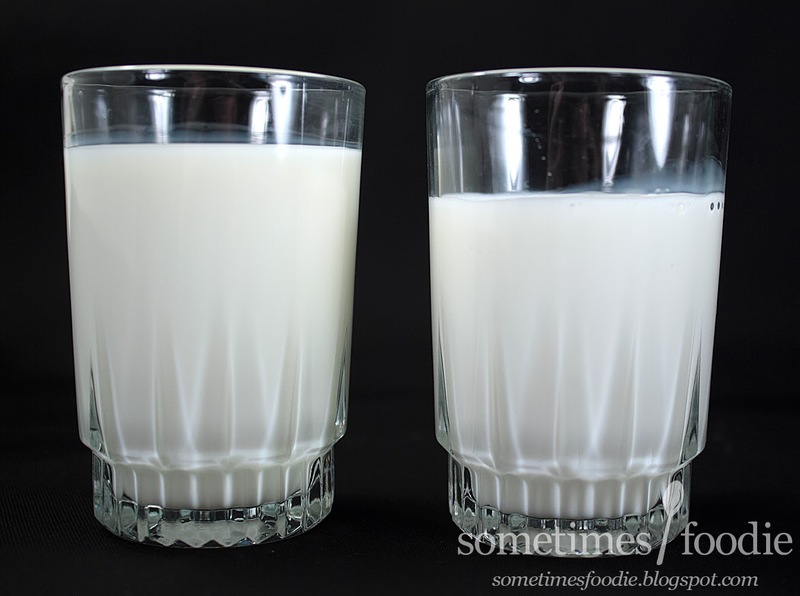 If you look at the milky area on the glass where milk had touched it, the organic version has a crisp clean line, while the generic version is almost misty. The coloring was pretty close too. The organic milk was a slightly more off-white color, but it wasn't a night and day difference. Without my photo lights you can't tell the difference between the two at all. Neither milk had much of a smell, so there was nothing to report on there, so it comes down to the taste. Will the fancy, more natural, milk taste better? The foodie in me wishes that I could tell you that my mind was blown and they were entirely different, but that sadly wasn't the case. The difference in taste was actually subtle and a bit difficult to describe, so I'll do my best. 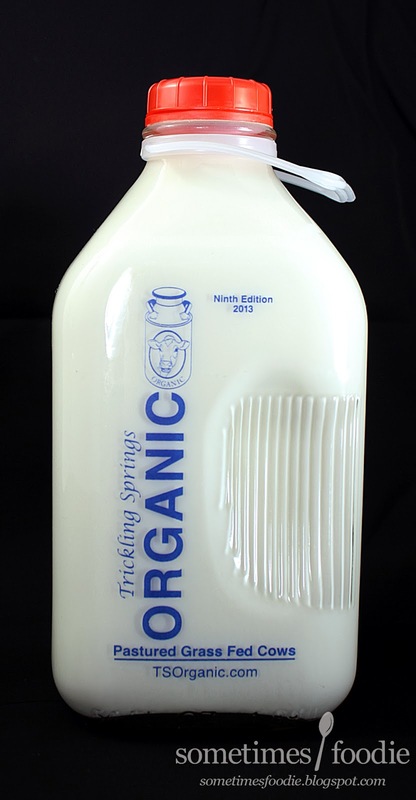 The organic milk is quite similar, but I get that milky taste a lot sooner. I don't have to wait until I have swallowed to get that creamy dairy-like mouth feeling. (FML what am I writing?) With that being said, the tastes were very similar, if not entirely the same. I just got that milky flavoring a lot sooner and it stayed after I swallowed, kind of like the film that you can see on the drinking glasses. The organic tasted just the tiniest bit stronger than the generic. I'm a little disappointed that the two were so similar, but I am still happy I purchased this milk. The glass bottle keeps it a lot colder than a paper carton or plastic jug, and nothing is better than supporting local farms and having ice cold milk. I don't know if I'll be returning this bottle for it's deposit and buying another just yet, I guess I'll figure that out once all my milk is gone.